1. David Palmer, In Search of Cumorah: New Evidences for the Book of Mormon in Ancient Mexico (Bountiful, UT: Horizon Publishers, 1981), 28–53, esp. 44–53; Matthew P. Roper, “Plausibility, Probability, and the Cumorah Question,” Religious Educator 10, no. 2 (2009): 135–158. 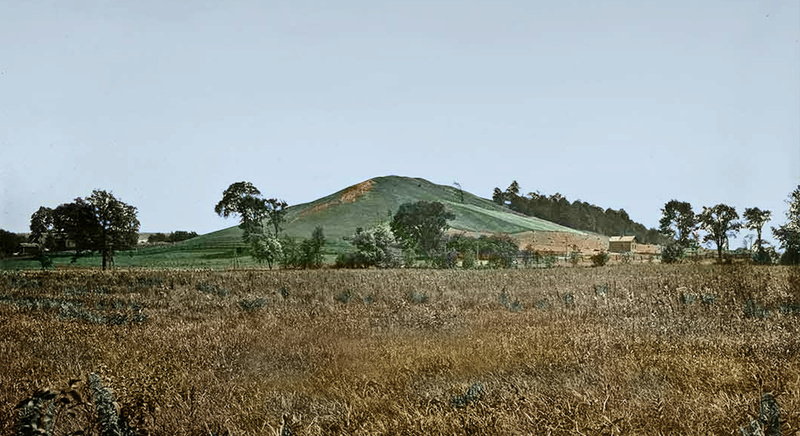 These additional criteria for the location of Cumorah inferred from the text have been critiqued by Andrew H. Hedges, “Cumorah and the Limited Mesoamerican Theory,” Religious Educator 10, no. 2 (2009): 111–134. 2. Jed Woodworth and Matt Grow, “Saints and Book of Mormon Geography,” online at www.history.lds.org. 3. See Michael J. Dorais, “The Geologic History of Hill Cumorah,” Journal of Book of Mormon Studies 13, no. 1–2 (2004): 136–43, 173–74. 4. William W. Phelps, “The Book of Mormon,” The Evening and the Morning Star 1, no. 8 (January 1833): 57. 5. Oliver Cowdery, “Letter VII,” in Latter Day Saints’ Messenger and Advocate 1, no. 10 (July 1835): 158–159. 6. This is reflected in early Latter-day Saint popular culture, such as hymns which speak of Cumorah. See for instance “An angel came down from the mansions of glory,” in A Collection of Sacred Hymns, comp. Emma Smith (Kirtland, Ohio: F. G. Williams, 1835), #16; “An Angel from on high,” in A Collection of Sacred Hymns, comp. Brigham Young, Parley P. Pratt, and John Taylor (Manchester, England: W. R. Thomas, 1840), #197. Contemporaneous Latter-day Saint missionary publications likewise reflect this understanding. See Orson Pratt, A Interesting Account of Several Remarkable Visions, and of the Late Discovery of Ancient American Records (Edinburgh, Scotland: Ballantyne and Hughes, 1840), 22; Orson Pratt, “The Hill Cumorah,” The Latter-day Saints’ Millennial Star 28, no. 27 (7 July 1866): 417–419. 7. Letter to “The Church of Jesus Christ of Latter Day Saints,” 6 September 1842 [D&C 128], 7. 8. See History, circa Summer 1832, 4; History, 1838–1856, volume A-1 [23 December 1805–30 August 1834], addendum, 7; Elders’ Journal (July 1838): 43. 9. See Matthew Roper, “Limited Geography and the Book of Mormon: Historical Antecedents and Early Interpretations,” FARMS Review 16, no. 2 (2004): 225–275; “Joseph Smith, Revelation, and Book of Mormon Geography,” FARMS Review 22, no. 2 (2010): 15–85; Matthew Roper, Paul J. Fields, and Atul Nepal, “Joseph Smith, the Times and Seasons, and Central American Ruins,” Journal of the Book of Mormon and Other Restoration Scripture 22, no. 2 (2013): 84–97; Neal Rappleye, “‘War of Words and Tumult of Opinions’: The Battle for Joseph Smith’s Words in Book of Mormon Geography,” Interpreter: A Journal of Mormon Scripture 11 (2014): 37–95; Matthew Roper, “John Bernhisel’s Gift to a Prophet: Incidents of Travel in Central America and the Book of Mormon,” Interpreter: A Journal of Mormon Scripture 16 (2015): 207–253; Mark Alan Wright, “Joseph Smith and Native American Artifacts,” in Approaching Antiquity: Joseph and the Ancient World, edited by Lincoln H. Blumell, Matthew J. Grey, and Andrew H. Hedges (Salt Lake City and Provo, UT: Deseret Book and Religious Studies Center, Brigham Young University, 2015), 119–140; Matthew Roper, “Joseph Smith, Central American Ruins, and the Book of Mormon,” in Approaching Antiquity, 141–162; Brant A. Gardner, Traditions of the Fathers: The Book of Mormon as History (Salt Lake City, UT: Greg Kofford Books, 2015), 375–379. 12. David Whitmer Interview with Orson Pratt and Joseph F. Smith, 7–8 September 1878, in Dan Vogel, ed., Early Mormon Documents, 5 vols. (Salt Lake City, UT: Signature Books, 2003), 5:44–45. 13. Martin Raish, “Encounters with Cumorah: A Selective, Personal Bibliography,” Journal of Book of Mormon Studies 13, no. 1–2 (2004): 40; Brant A. Gardner, The Gift and Power: Translating the Book of Mormon (Salt Lake City, UT: Greg Kofford Books, 2011), 129–131. 14. Cameron J. Packer, “Cumorah’s Cave,” Journal of Book of Mormon Studies 13, no. 1–2 (2004): 50–57, 170–71. 15. Packer, “Cumorah’s Cave,” 52. “With these reports of a cave in the Hill Cumorah comes the question, Was this a real cave that Joseph and others actually walked into, or was it a visionary, or ‘virtual,’ experience? The wording of the accounts leaves the issue open.” See also John A. Tvedtnes, “Review of Little Known Evidences of the Book of Mormon by Brenton G. Yorgason,” FARMS Review of Books 2, no. 1 (1990): 258–259; John E. Clark, “The Final Battle for Cumorah,” Review of Books on the Book of Mormon 6, no. 2 (1994): 95–98. 16. See for instance Joseph Fielding Smith, Doctrines of Salvation, comp. Bruce R. McConkie (Salt Lake City, UT: Bookcraft, 1956), 3:232–243; Marion G. Romney, “America’s Destiny,” Ensign (Nov 1975); Rod L. Meldrum, Exploring the Book of Mormon in America’s Heartland: A Visual Journey of Discovery (New York, NY: Digital Legend, 2011), 38–47. 17. “Some say the Hill Cumorah was in southern Mexico (and someone pushed it down still farther) and not in western New York. Well, if the Lord wanted us to know where it was, or where Zarahemla was, he’d have given us latitude and longitude, don’t you think? And why bother our heads trying to discover with archaeological certainty the geographical locations of the cities of the Book of Mormon like Zarahemla?” Harold B. Lee, “Loyalty,” in Charge to Religious Educators, 2nd ed. (Salt Lake City, UT: Church Educational System and the Church of Jesus Christ of Latter-day Saints, 1982), 65. See further the quotations from Church leaders collected and analyzed in Roper, “Limited Geography and the Book of Mormon,” 255–260; “Joseph Smith, Revelation, and Book of Mormon Geography,” 17–22. 18. Palmer, In Search of Cumorah; John L. Sorenson, An Ancient American Setting for the Book of Mormon (Salt Lake City and Provo, UT: Deseret Book and FARMS, 1985), 44, 347–351; Sidney B. Sperry, “Were There Two Cumorahs?” Journal of Book of Mormon Studies 4, no. 1 (1995): 260–268; David A. Palmer, “Cumorah,” in Encyclopedia of Mormonism, ed. Daniel H. Ludlow (New York, NY: Macmillan, 1992), 1:346–347; John E. Clark, “Archaeology and Cumorah Questions,” Journal of Book of Mormon Studies 13, no. 1–2 (2004): 144–51, 174; John L. Sorenson, Mormon’s Codex: An Ancient American Book (Provo, UT: Neal A. Maxwell Institute, 2013), 142–143. 19. Rex C. Reeve Jr., “Hill Cumorah,” in Encyclopedia of Latter-day Saint History, ed. Arnold K. Garr, Donald W. Cannon, and Richard O. Cowan (Salt Lake City, UT: Deseret Book, 2000), 481. 21. See Saints: The Story of the Church of Jesus Christ in the Latter Days (Salt Lake City, UT: The Church of Jesus Christ of Latter-day Saints, 2018), 20–42. 23. Widtsoe, “Is Book of Mormon Geography Known?” 547. 24. “Special Witnesses of Christ,” Ensign, April 2001, 19–20. 25. Widtsoe, “Is Book of Mormon Geography Known?” 597.